CulturePath stands out among its peers as a Top HR Product. It was recognized by Human Resource Executive® for offering value to the HR community while demonstrating innovation. CulturePath — Cloud-based and data-driven analysis of organizational culture used to drive change in the areas that matter most to a business. CulturePath assesses an organization based on cultural indices critical to business outcomes and provides insights for organizational change. Capture essential cultural insights from your selected employee population through our survey and analytics tools. Measure and tackle the true emotional drivers of behaviors that are essential to the mission and strategy of an organization. Comprehensive measurements and insights essential to understanding your organization's strengths and gaps, and to driving the behaviors needed to support the business strategy. A comprehensive diagnostic solution that helps organizations drive precise and targeted cultural change. Organizations should make emotional connections in order to motivate their employees, and now we can measure those drivers. Perform comparative analyses using an intuitive and interactive dashboard. Apply time-tested methodologies and culture advisory services from the leading organizational change consultancy. Learn from leading practices that exist within your organization. Identify groups and locations that are already aligned with cultural goals. Watch your organization make progress and course-correct as needed. better workplace culture and bigger results. "CulturePath provided a structured framework to measure our culture, and when we analyzed those findings with other performance and sales capabilities data, it generated rich insights and actionable behavior changes." Jos Brenkel, Global Head of Sales Strategy and Operations, HP Inc.
Read more of this interview covering a variety of topics related to culture and engagement. Deloitte’s Marc Kaplan discusses how organizations with the competency and discipline to drive culture change will have a competitive advantage in unlocking higher performance. Deloitte’s Sonny Chheng and Alyson Daichendt discuss how an organization’s mission can attract employees and give them a reason to stay. Deloitte's Marc Kaplan discusses the importance of making a plan to address corporate culture and why not to discourage innovation during a merger or acquisition. Deloitte's CulturePath solution is named a Top HR Product, recognized for offering value to the HR community and delivering innovation. Deloitte's Anthony Abbatiello discusses how Millennials are changing how organizations approach workplace culture, along with the steps necessary for a corporate culture to thrive. Deloitte's Anthony Abbatiello suggests considering "four factors of potential" when identifying future leaders, in the context of an organization's corporate culture. Deloitte's Marc Kaplan discusses why organizational transformation is incomplete without engaging talent. Deloitte's Marc Kaplan discusses why social activities don't always solve workplace culture issues in this BBC article. Learn the 3 steps to define and measure workplace culture in this Talent Economy interview. Identifying misalignment of culture and business goals can be a challenge to suss out, but if done correctly can help drive and improve business results. Read why workplace culture is one of the biggest obstacles leadership faces in executing business strategy. ChinaGorman.com: Should leaders wear their hearts on their sleeves? CulturePath's idea of putting emotion in the workplace culture equation is highlighted in this "Data Point Tuesday" blog series. Learn about the importance of culture for private companies and why making it a priority could lead to long term organizational success. CIOs who shape the culture of their IT organizations tend to achieve much better alignment and cultivate strong engagement among employees. This segment features a discussion about data-driven analytics and how it impacts corporate culture. ©2016 Bloomberg L.P. All rights reserved. Used with permission. CulturePath aims to help organizations better align their employees' attitudes and behaviors to overall business strategy. Organizations that want to inspire the best from their employees must acknowledge that motivations have changed and respond accordingly. CulturePath helps identify misalignment between business strategy and workplace culture. The Employee Experience – Culture and Engagement: How do they differ, why do they matter, and how do they connect to drive strategy? Join us as we discuss how workplace culture and employee engagement can help drive strategy and improve the bottom line. Deloitte Dbriefs "The employee experience: Culture, engagement, and beyond"
With more networked, team-based organizational structures, culture and engagement are still important, but they’re not enough alone. What are companies doing to become irresistible places to work? Learn why HR departments are starting to monitor the health and productivity of employees just as rigorously as marketing departments do customer experience. Join Deloitte and our analytics solutions, CulturePath and EngagePath, at this year’s SHRM 2017, Society of Human Resource Management’s annual conference and one of the world’s largest HR marketplaces. Visit Deloitte at this year's HCI Employee Engagement conference and learn more about our EngagePath solution, which helps organizations measure, monitor, and improve employee engagement. Join Deloitte and our analytics solutions, CulturePath and EngagePath, at this year’s HR Technology Conference, home to the world's largest expo of HR technology products and services. Join Alyson Daichendt, Stephen Redwood, and Madhura Chakrabarti at IMPACT 2017, Bersin by Deloitte's annual research-based executive conference for HR, learning and talent executives, for a workshop on "The Simply Irresistible Organization™: Transforming Employee Engagement." Robin Lissak, Principal, Deloitte Consulting LLP, speaks on driving business results with happy employees on Thursday, March 2 at 1:30pm. Culture vs. Engagement: How do they differ, why do they matter, and how do they connect to drive strategy? Deloitte leaders Josh Bersin, Sonny Chheng and Alyson Daichendt discuss how workplace culture and employee engagement can help drive strategy and improve the bottom line. Business leaders recognize that corporate culture drives strategy. How can HR leaders encourage senior executive ownership of culture, while measuring and managing culture in alignment with business goals? Join us as we discuss how CEOs and executive teams can take responsibility for an organization's culture and how HR can support that responsibility. HR Technology® is home to the world's largest expo of HR technology products and services. Hear Alyson Daichendt speak on “Moving the Needle on Engagement" on October 6th at 4 p.m., visit booth 1131 to see a demo, attend the awards luncheon on October 5th at 12 p.m., honoring CulturePath and other Top HR Products of 2016, and join our refreshment break in the booth on October 5th at 4:30 p.m. Recent event May 11-13, 2016 | Washington, D.C.
Alyson Daichendt, Managing Director, Deloitte Consulting LLP, speaks about the board's role in workplace culture. At IMPACT 2016, Bersin by Deloitte's annual research-based executive conference for HR, learning and talent executives, our leaders hosted a demo of CulturePath. Deloitte's Anthony Abbatiello speaks on how Deloitte is approaching measuring workplace culture and what is needed to move the needle to close the gap between behavior and desired business outcome. Deloitte Dbriefs "The culture challenge: Tackling one of HR's top issues today"
Many forces are converging to make cultural alignment a priority for businesses. How can HR executives more actively manage culture to drive critical business outcome? 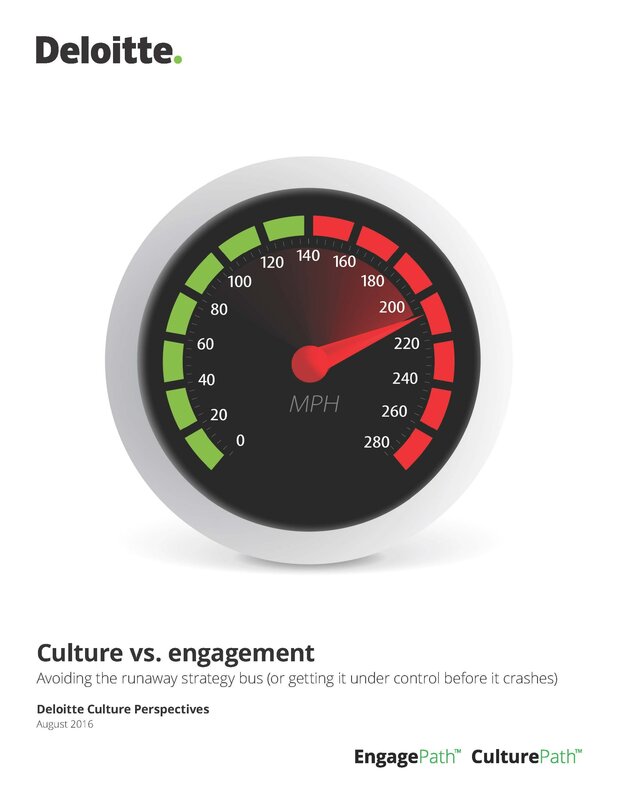 Deloitte Dbriefs "Employee engagement and culture: The naked organization"
In today's glass door era where corporate decisions are exposed and debated publicly, employee engagement and culture have emerged as foundational business issues. More than 10,000 HR and business leaders from 140 countries offered input on the top trends within the HR industry, with building the organization of the future emerging as their highest priority. Other top rated trends include careers and learning, talent acquisition, employee experience, performance management, and leadership. In M&A transactions, safeguarding company culture is critical to enabling performance and protecting the deal value. By understanding and shaping culture throughout the deal lifecycle, companies can drive business strategy and achieve operational and financial objectives. Employee engagement extends beyond employee satisfaction—and an active and inclusive approach can capture the distinction that will move the needle where it matters most. Analyzing three years of data collected by Deloitte, the report demonstrates that purpose-driven millennials seek innovation and collaboration, with room to spearhead their own career paths. Leaving behind “the way we've always done it,” millennials are finding their own way. Deloitte's business confidence report took the pulse of 600 of America's top business leaders and examined their levels of confidence to outperform competitors and their views on key business issues like innovation, talent, and bold leadership. 82 percent of the respondents to our 2016 Global Human Capital Trends survey believe that workplace culture is a potential competitive advantage. Today, new tools can help leaders measure and manage culture toward alignment with business goals. Two years of research and discussions with hundreds of clients suggest five major elements and underlying strategies that work together to make organizations "irresistible." Dramatic transformation forces demand new approaches for organizations, careers, and the future of work, according to the 2017 Global Human Capital Trends Survey. Deloitte refers to one or more of Deloitte Touche Tohmatsu Limited, a UK private company limited by guarantee (“DTTL”), its network of member firms, and their related entities. DTTL and each of its member firms are legally separate and independent entities. DTTL (also referred to as “Deloitte Global”) does not provide services to clients. In the United States, Deloitte refers to one or more of the US member firms of DTTL, their related entities that operate using the “Deloitte” name in the United States and their respective affiliates. Certain services may not be available to attest clients under the rules and regulations of public accounting. Please see www2.deloitte.com/about to learn more about our global network of member firms. Learn more about how ConnectMe can help you establish a digital workplace for your employees. Get additional information about how CulturePath can help drive your organization's culture. By clicking submit you agree to receive emails from our website. You can unsubscribe at any time.